Earthquakes are a serious threat to life and property not just in California, but in many parts of the United States. Areas of the country that are less prone to seismic activity typically have less stringent building codes that govern earthquake preparedness. Catastrophic earthquakes are rare, but even minor ones can cause substantial damage to homes that are not sufficiently reinforced. Inspecting for earthquake preparedness is not within the scope of InterNACHI’s Standards of Practice; however, an inspector may want to be aware of and look out for common weaknesses in a home in regions prone to even minor seismic activity. 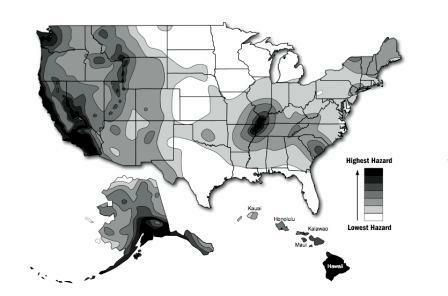 Homeowners significantly decrease the probability that their homes will be adversely affected by a seismic event if these weak spots have been identified and addressed before an earthquake strikes. According to the Federal Emergency Management Agency (FEMA), 45 states and territories in the United States are at moderate to very high risk for earthquakes. Damage resulting from earthquakes in the United States is estimated at $4.4 billion per year, according to a 2000 FEMA report. Shaking ground accounts for 99% of earthquake-related damage to residences. Other earthquake-related events, such as fault ruptures, liquefaction of soil, dam failure, lateral spreading, landslide, and tsunami account for the remaining 1% of damage. Natural gas connections may rupture or break during an earthquake, which, if ignited by an errant spark or other catalyst, results in gas leaks, fire and/or explosion. Full water heaters typically weigh approximately 450 pounds. Unbraced water heaters may fall over during an earthquake and rupture water, gas and/or electrical connections, resulting in an electrical or fire hazard. Homes that are not properly secured to their foundations or that do not have sturdy foundations may break loose and cause gas connections to rupture and a subsequent fire hazard. Older concrete foundations are at a higher risk because the concrete may have already started to crumble and weaken over time. Homes built on unreinforced concrete, brick or stone masonry foundations are also at a higher risk. Stud walls holding up a home’s crawlspace that are not properly braced for horizontal movement may fail, causing a home to fall. 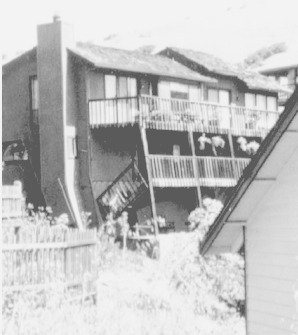 Homes that are built on steep slopes may collapse if the posts that support them are not properly braced. Walls that are constructed out of unreinforced clay, concrete, stone, adobe or brick masonry may fail in an earthquake because the mortar that binds them together is typically not strong enough to sustain seismic activity. Rooms that are built over garages may collapse during an earthquake because the strength of the walls in the vicinity of the opening of the garage door is reduced. Unreinforced masonry chimneys may collapse during an earthquake. The section above the roofline is particularly at risk, and bricks may fall into the home. Heavy furniture, shelving and appliances that are not anchored may become dislodged during an earthquake and can cause damage or injury, or can block an emergency exit for occupants trying to escape. Windows may shatter during an earthquake and can cause injury. Toxic substances that are stored in breakable containers may spill during an earthquake and cause a hazard to occupants. Any appliances in the home that run on natural gas should be securely anchored to the floor or walls. Water and gas pipes should be flexible to prevent ruptures and leaks. If no automatic gas shutoff valve is installed, the manual gas shutoff valve should be in a location that is accessible to occupants in the event that they need to shut it off quickly. Cement foundations should not be seriously cracked or crumbling. Homes should be securely bolted to the foundation. Wood stud walls supporting the first floor should be braced with plywood panels nailed to the studs or diagonal wood sheathing. 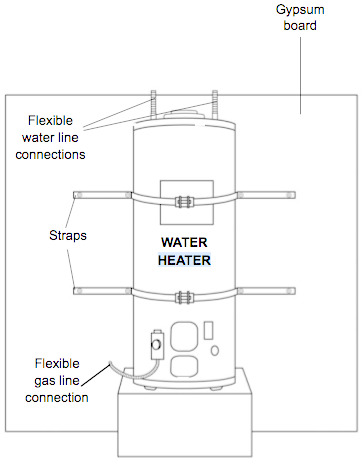 Freestanding water heaters should be braced with steel plumber’s tape or with metal straps attached to wall studs. Braces or plywood panels should surround and reinforce garage doors that are not in line with the rest of the house. Masonry foundations and walls should be strengthened with steel reinforcement. Columns and walls that support homes on hillsides should be adequately braced. There should be sheet metal straps and angle bracing installed to hold the unreinforced masonry chimney to the house. Plywood panels should be present at the ceiling or roof to prevent bricks from falling into the home. Children’s’ play areas should be located away from the chimney. Large appliances and furniture inside the home should be secured to the walls or floor with flexible cable, braided wire or metal strapping. Heavy objects or mirrors should be installed away from beds. Cabinets that contain heavy or breakable objects should be secured with sliding bolts or childproof latches on the doors. Hazardous materials should be kept in non-breakable containers and stored securely away from heat sources and appliances. In summary, the extent of damage caused by an earthquake is typically more substantial if a home has not been prepared for an earthquake before it strikes. Homeowners can take appropriate measures by having their homes inspected annually by an InterNACHI inspector.